Compass: A tool that can draw a circle and measure a distance. Measure a distance and copy that distance. McAdams, David E. Compass . 3/6/2019. All Math Words Encyclopedia. Life is a Story Problem LLC. http://www.allmathwords.org/en/c/compass.html. Compass: International Correspondence Schools, Scranton, PA., USA, commons.wikimedia.org. This work is in the public domain. 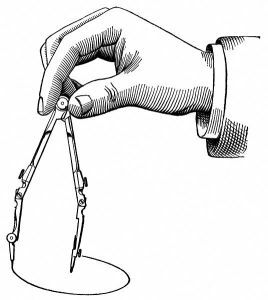 https://commons.wikimedia.org/wiki/File:Drawing-a-circle-with-the-compasses.jpg.